We returned to do our outdoor locale again, this time to make the Full Loop (and not the partial we did the other day). And a bit more. I also wanted to top up my Vitamin D.
Activity Device #1 indicated I did 1500 steps (‼️). Activity Device #2 indicated a super 2K steps. Before the foot thing, I notice #1 gave more than #2. Consistently. What does it mean that now #2 shows more steps? My gut feeling is that #2 registers my strange crutch-walking gait better than #1. And #1 excels at normal walking (“steps”). Reveal: #1 is my aging Fitbit One; #2 is my iPhone health app (comes with phone aka “camera”). BTW: if I have to replace my Fitbit (), I’m leaning toward the Nokia Steel…especially the not-yet-available model, the Steel HR (meaning heart rate). The downside is that it has the watch confirmation…so different than my present clips-on-my-underwear model (which I kinda like). TMI? This entry was posted on Monday, 30 October 2017 at 9:21 pm. What kind of berries are those? 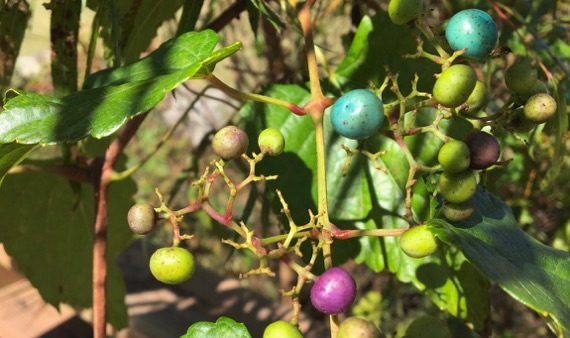 I’ve never seen turquoise berries before.